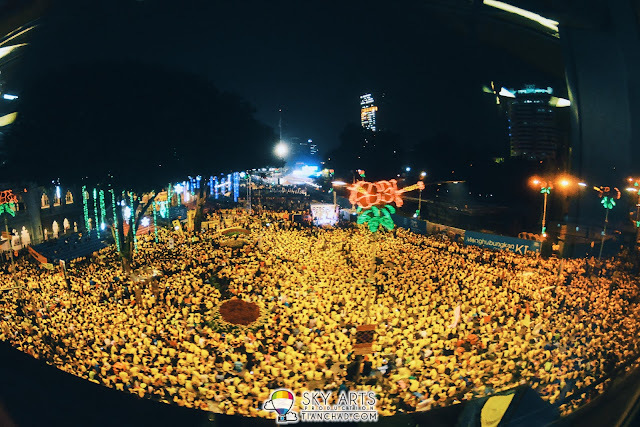 Just got back from the street photography of #BERSIH4.0 at Dataran Merdeka and Masjid Jamek area tonight. The crowd is definitely huge and it was hard to move around when I arrived at night. Decided to drop by this place quite last minute as it was raining in KL. Anyhow, I am glad I've made it to capture some precious moments of this event which happened in Malaysia. When I reached Masjid Jamek LRT Station the whole place was crowded already, it was not easy to move around. Some of them sitting on the floor focusing on the truck which has speakers giving speech and some just move around trying to reach Dataran Merdeka. I gave up trying to reach Dataran Merdeka as I know it is totally full with people in yellow shirts. Hence I decided to leave around 11.30pm by taking the LRT and this is what I saw when the LRT moving from Masjid Jamek to Bandaraya. The view was astonishing as you can see from the photo above. Can you estimate how many people are there in this place?? Stay tuned for more of my street photos captured during my adventure to the Bersih Rally 4.0. I hope everyone has reached home safely after 12am countdown with our national anthem.